Before I go into how to cook jalapeno peppers, I want to caution you on handling these peppers. For years I have added one or two jalapeno peppers to many of my recipes. I never had a problem simply using my bare hands. Of course, I was always cautious not to get my hands around my face or eyes. 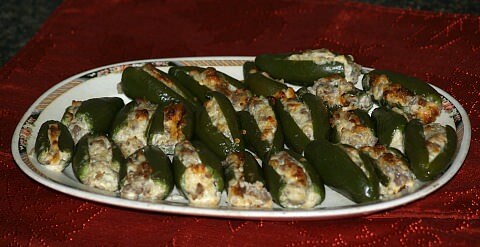 The first time I made a recipe of stuffed jalapenos using 20 peppers, I began to feel a burning in my hands. I washed my hands really good in soapy water and then I washed them with baking soda trying to cool them down. My hands continued to burn for three days. At night I placed my hands on a cold pillow so I could sleep. I have known of people who had to go to the hospital with blisters and very red hands from handling the peppers. I don’t’ even want to mention the people who got the peppers in their eyes. I am telling you how to handle peppers because this is serious! 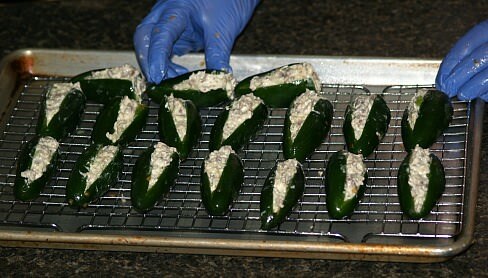 If you are learning how to cook jalapeno peppers, start wearing gloves right away and make it a habit. As soon as you finish you can remove the gloves. Not only do you save your hands but you will not have to worry about touching your eyes. 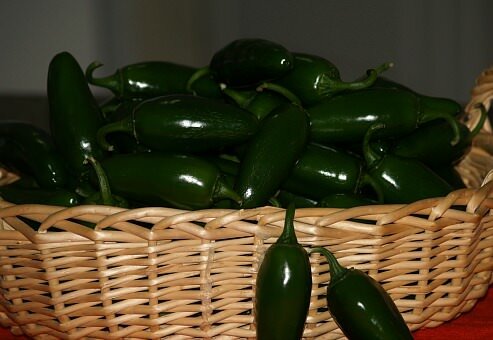 When I learned how to cook jalapeno peppers I found them to be very abundant in the summer months. If you have grown these peppers then you know how many peppers one plant will produce. Many are given to me each growing season. Since I use these peppers all year long, I throw them in 2 gallon freezer bags and place them in my freezer. When I take out what I need, it only takes a couple of minutes for them to thaw enough to remove the stems and seeds. If you are learning how to cook jalapeno peppers which have been frozen, there is only a slight difference from using fresh ones. This is no problem at all when adding to soups, stews and sauces. The only thing I learned to vary is when I bake them. After freezing, peppers and other vegetables will be a little wetter. When I bake jalapeno peppers, I place them on racks or on my broiler pan so the liquid can drain and dry them out a little more. Another thing you need to know when learning how to cook jalapeno peppers is that they are not all the same. You can plant the same type every year and they might turn out different each year. The heat in jalapeno peppers and the size can vary tremendously. The weather condition has a great effect on the harvested peppers. This year was a tremendously hot summer. You can tell this by the heat in the peppers. It is impossible to eat them without a slice of bread in one hand and the pepper in the other hand. No matter how you eat them, if you like peppers these are wonderful. My entire family has learned how to cook jalapeno peppers with this recipe. They are delicious! Cook sausage over medium heat stirring until crumbly. When almost done stir in onions, garlic, salt and pepper; stir until onions are tender and sausage is done. Blend cream cheese and Parmesan into sausage mixture; set off to cool. USING GLOVES cut stems off peppers; make a slit down pepper and remove seeds. NOTE: When making a lot, I sometimes prep the peppers the day before. Stuff peppers with sausage cheese mixture; place in lightly oiled baking pan. Bake about 40 minutes until hot. Learning how to cook jalapeno peppers in this recipe has made hominy a favorite for those who never liked hominy. Sauté onion and jalapeno in melted butter in a large skillet for 5 minutes. Add hominy, chili powder, sour cream and black pepper; stir to blend. Stir in ½ cup of shredded cheese; pour into a lightly oiled casserole baking dish. Bake for 20 minutes; sprinkle remaining cheese over the top and bake until cheese melts. I have always loved dirty rice. Learning how to cook jalapeno peppers in this recipe has given it an added spiciness. Sauté chicken livers and sausage in a skillet until thoroughly cooked; drain mixture and set aside. Melt butter in skillet; sauté onion, celery, jalapeno, green onion, parsley and garlic in butter until tender. Add chicken livers, sausage, thyme, basil and black pepper; blend well. Stir in cooked rice and chicken broth; cook and stir over medium heat until hot. NOTE: If your jalapeno pepper is not real hot (As you like) top with hot pepper sauce. NOTE: As I learned how to cook jalapeno peppers, I found the heat in them to vary tremendously. If your peppers are really hot, you may want to use only one. Combine jalapeno peppers with black beans, corn, onion, bell pepper, vinegar, olive oil, mustard, salt and black pepper. Cover jalapeno mixture and chill at least 2 hours. In a small bowl combine chili powder, cumin, salt and black pepper; sprinkle over chicken breasts. Melt butter in a large skillet; add chicken and cook 5 to 7 minutes on each side or until done. In food processor finely chop red bell peppers and jalapeno peppers with a little of vinegar. Place chopped peppers in a stainless steel pan; add remaining vinegar and the salt. Bring the mixture to a boil and then simmer over medium for 5 minutes. Remove from heat and measure; add enough lime juice if needed to make 3 cups. Place mixture back in pan; stir in the sugar and pectin and mix well. Stir mixture while bring to a rolling boil; cook for 4 to 5 minutes. Remove pan from heat and skim off foam; add hot pepper sauce if desired. Ladle into 2 pint jars leaving ¼ inch headspace; adjust lids and process in hot water bath for 5 minutes.